Saturday was a busy day. Whit left early in the day to play in a soccer tournament, which he enjoyed immensely. And I ended up spending the afternoon shopping with the girls. We had a blast! It was so much fun to shop with someone who didn’t roll his eyes or tap his foot or tell me he’s going to wait outside. I forgot how much fun it could be. We all bought a few things. Shopping is cheaper here. I bought a nice turtle neck sweater for $13. We had coffee and hot chocolates next, sitting in Paris Baguette downtown and talking and laughing like only girls can. And then, we headed to the photo booths that are everywhere. You’ve already seen the photos of Whit and me. But these were even more fun. We put on wigs and picked out fun borders for the tiny photos that are made into stickers. It’s so funny how this is all the rage here. We checked in with the boys to see if they were still playing soccer and they told us they were headed to the public bath, also known as the spa, in Korea. Also known as a jjimjilbang, which is open 24 hours and offers everything from hot and cold baths to saunas to PC rooms to sleeping rooms, it always has one area for the women and another for the men. And of course, everyone is naked. I’ve never been a fan of being naked in front of others. It’s just a modesty issue I guess. But I knew I needed to take part. So when I heard the boys were going, I talked Maria and Catie into it as well. Catie is our “spa expert.” She probably goes once a week to the spa in her neighborhood. She was always a fan of going back in San Francisco where she lived before moving here. So with her by our side, Maria and I upped our courage and got naked. As soon as we walked in the door and paid our $4 each, we stepped into an area where bare skin abounded. I walked with my head down straight to my locker. And Catie stripped down just like that. Maria and I looked at each other, one last “are we sure we want to do this?” Catie didn’t give us much time to think about it. So we stripped down and carried our very small towel to the women’s public bath area. My biggest fear was that the Koreans were going to stare at us, look at us like aliens. This always happens in the street and I usually feel like I have walked out of my apartment naked the way they stare at me. But to be actually naked in front of them. I didn’t know what would happen. But they didn’t stare. Everyone was naked. No big deal. And it turns out, we all have the same body parts. Even in Korea. Some people are skinny. OK, a lot are skinny. Some people are bigger. Some have wrinkles. Some have fat. Sorry, I have no real photos. Wasn’t exactly a place where you should take pictures. We all sat naked in the pools filled with steaming hot water and cold water and minerals that made your skin soft and talked and laughed. Korean women washed each other along the side walls, scrubbing their skin with loofahs until raw. Korean girls gathered around us in one pool and talked to us like excited schoolgirls. It was a great experience. One that I can now look back on and laugh about my hesitation. Whit also had a great time with the men. 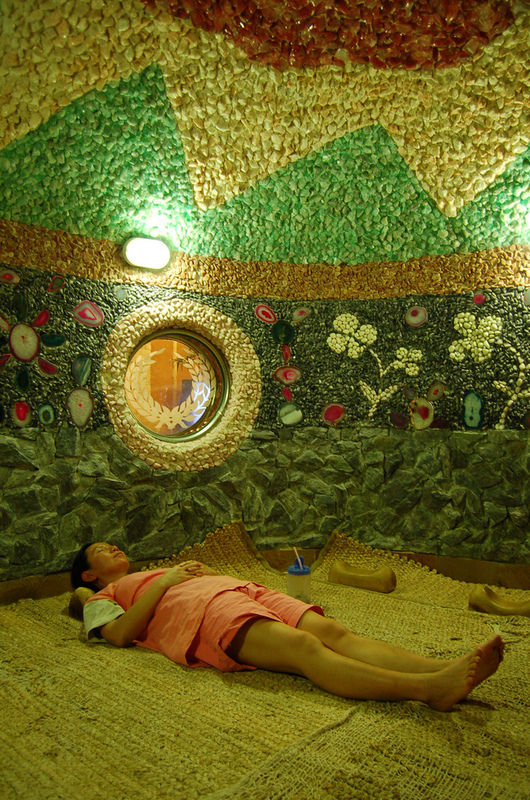 It turns out that we were all in the same spa in downtown Gwangju. They were just on the other side. And we all went home with smooth, yummy-smelling skin and new bragging rights. I love the photos you posted of the mountains and rock outcroppings. They are so beautiful! I dont know if you still check comments on this blog but I am teaching English near Gwangju and I was hoping you coule reccomend a bath house. I am going to look at your photos now.